Diplomatic source: She was not invited by Israel. "Mogherini's positions are very hostile toward Israel." 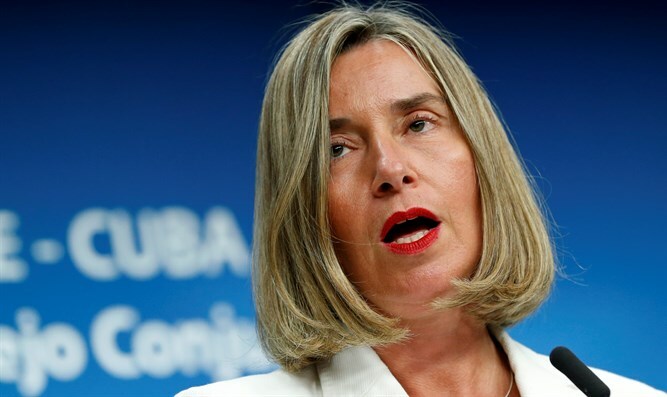 EU foreign affairs chief Federica Mogherini has cancelled her visit to Israel, which was planned to take place Sunday, after learning that Prime Minister Binyamin Netanyahu does not want to meet her. A diplomatic source said: "She was invited by a pro-Jewish organization to their conference, and not by Israel. Mogherini's positions are very hostile toward Israel." Israeli TV's Hadashot news reported earlier that Mogherini asked to meet with Netanyahu during her stay in Israel next week, but her request was denied. Mogherini was invited to speak at the American Jewish Committee’s Global Forum conference in Jerusalem. She is currently in Jordan. Relations between the EU and Israel have been strained since the EU expressed opposition to the relocation of the US embassy to Jerusalem. In addition, the EU demanded an investigation into the arrest of Arab nationalist Ja'afar Farah during a violent demonstration in Haifa. The EU reportedly said that the visit was cancelled because the time at which she was supposed to speak at the conference clashed with her schedule.